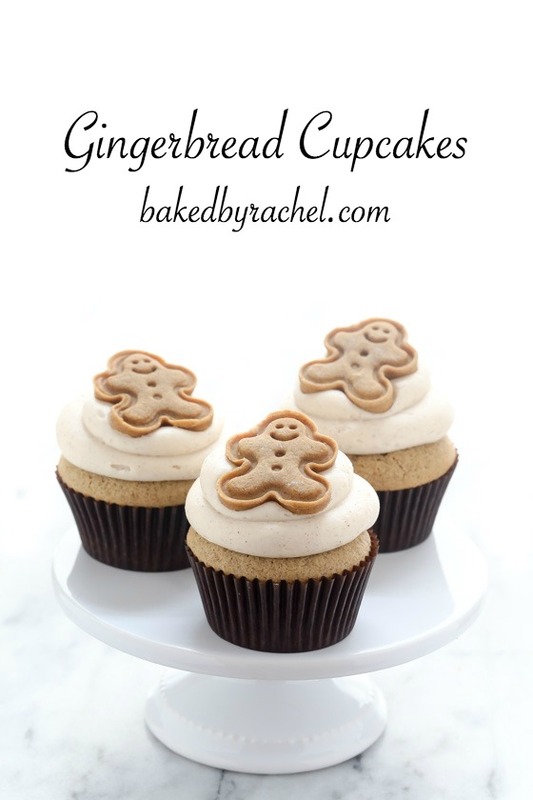 A small batch recipe for easy homemade moist gingerbread cupcakes with brown sugar cinnamon cream cheese frosting. 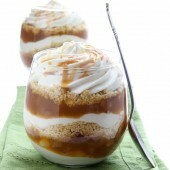 A must make holiday dessert! Being an adult can be really dumb, in the sense that you get excited over things you never EVER expected to be happy about as a child. For example… furniture or new appliances. I mean, what kid would really be excited about that, unless it’s for their own room and it’s super cute and awesome – right? Well, this time, it’s window candle holders. I planned really poorly and bought electric window candles for the holidays. The cords make them so they not only all have to be plugged in (obviously)… but also, make them ridiculously hard to stay up on their own. The candles are lightweight so the cord weight pulls them down. Let’s not even discuss the fact that we have to unplug/plug them whenever we want them off or on. Anyway, long story short… I found these suction cup window holders specifically designed to hold window candles. My fear was that the suction cups would eventually give out and they’d fall off the window…been there and it always annoys me. *knocking on wood* So far everything is staying put so I bought more for the rest of the house. If you’re in my pathetic, totally non-important, situation – you should definitely get some. We’re still on a holiday movie binge. That’s what December weekends are for, right? This weekend the notable ones were Prancer (don’t even waste your time on it if you haven’t already – it’s awful) and the original Miracle on 34th Street. When I bought that, I was sure I’d enjoy it more than the newer version, because that’s typically how it goes for me. But after watching it the other day, I’ve decided the newer one is better. Go figure! Do you have a preference? 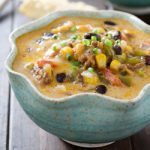 I tested this recipe so many times to get it exactly how I wanted it. 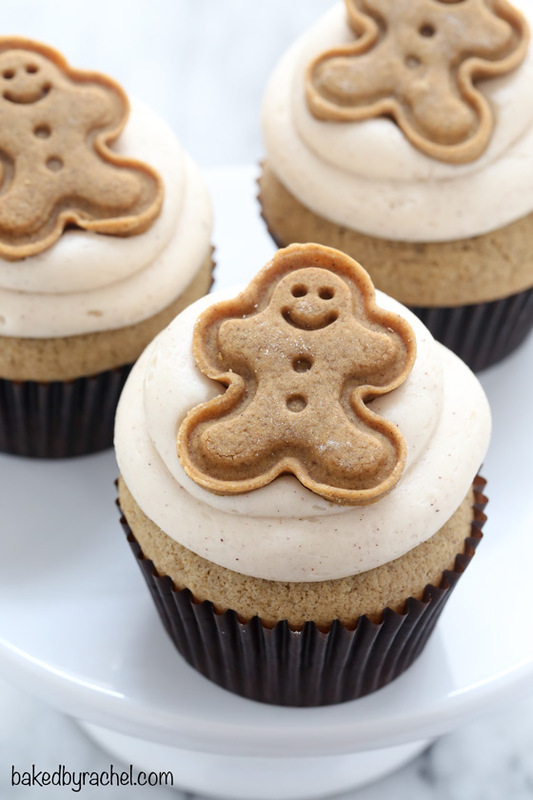 You can rest assured that this is the absolute perfect batch of moist gingerbread cupcakes. Tried and true. Amazing. Incredible. An absolute must make. 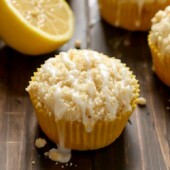 If you only make one cupcake recipe this month, it has to be these. December and gingerbread go hand in hand. They’re best buddies. 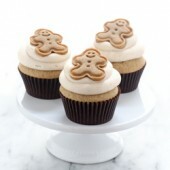 You have to enjoy a gingerbread treat or two before Christmas hits! 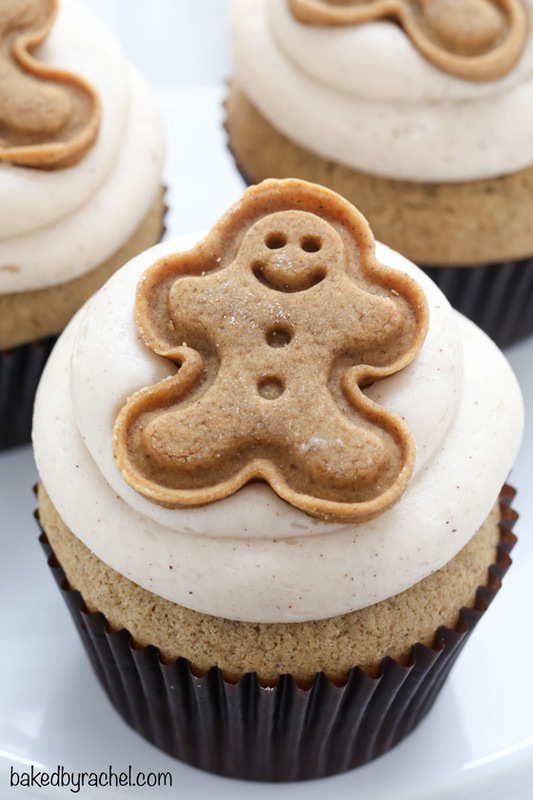 A small batch recipe for easy homemade moist gingerbread cupcakes with brown sugar-cinnamon cream cheese frosting and a mini gingerbread cookie topper! Hoping those suction cup window holders keep working – hey, I agree – any appliance/piece of furniture that solves an issue would get my older self excited too – but my younger self wouldn’t care! Oh my gosh, could these be any cuter? Seriously! Oh, these are just too cute. LOVE that gingerbread cookie cutter of yours! I feel like those suction things are quite good when they’re new, so I think you should be okay! Ahh these are so cute! I love the little gingerbread man on top of the frosting. A treat, for sure! How adorable are these cupcakes, I love the gingerbread topper! I baked these yesterday and they were really, really good. I didn’t have any cream cheese to make the frosting so I just used a powdered sugar glaze. 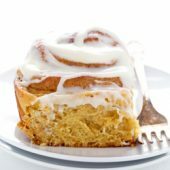 I’m sure they are even better with the real frosting. 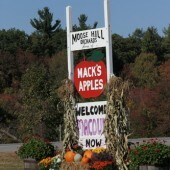 My husband loved them. I only have two left in the refrigerator today! What an awesome gadget! Ours usually fall over in the windows and sometimes I just leave them – whoops! These are SO lovely! But Prancer? You don’t like that movie!? Oh my god, it’s one of my favorites (assuming there isn’t some new version you are talking about). Tear. Haha it’s from the 80s I think? I’m not entirely sure but I wasn’t impressed. What a cute gingerbread man! Where did you find him? There is a link to the product at the bottom of the post. 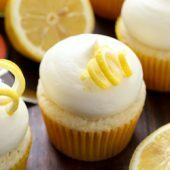 Great cupcake! I followed the directions and doubled the recipe along with the frosting recipe. 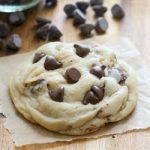 The only changes I would make the next time I make these is to use half oil and half butter. It was a slightly drier cupcake and I think subbing out some oil will help with adding moisture. Sorry for the typo. You should use baking soda. Have you ever tried making this recipe in cake form? I was interested in trying it that way bc I love the flavors compared to other recipes. 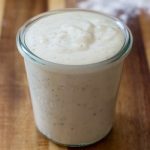 Any suggestions on doubling recipe/baking times would be appreciated. I also was wondering of how to make it slightly more most. I used full fat sour cream and baked for the minimum amount of 18 min. Any tips? I have not. The ingredient amounts and time will vary greatly depending on the size of your pan. It would be best to make the batter and fill your desired pan appropriately, then test it periodically for doneness. Is it really supposed to be 3 cups of powdered sugar for the frosting, or am I misreading? Follow the ingredients as listed for best results. I’ve made these twice now (first round as a practice for Christmas), really appreciate this post it was great and after adapting a few things it was a fantastic turnout so many compliments and they haven’t even been served properly yet! My cream cheese frosting wasn’t as fabulous as yours in the picture but will have to practice more variations. I made these gluten free using Better Batter flour and one of my christmas tree cupcake pans. They are amazingly flavorful. I added cardamon and a turmeric golden spice blend along with about 1/2 cup of candied ginger chopped up. 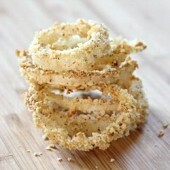 I made these once and this will become one of my go to dishes during the holidays. Amazing! Thank you! 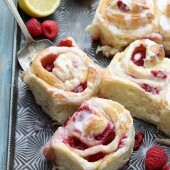 My family is used to me baking gluten free, these were moist, light, airy and simply delicious. Next time, instead of the water I am going to use ginger tea as well but I really love ginger. I did not have time to make the cookies yet but plan on it next time.